For nearly thirty years Keith Anderson, Owner of KA Architecture, Inc., has practiced architecture across a variety of project types from Legacy homes to European architecture. Keith Anderson is a Licensed AIA Bozeman, Montana architect who began his career designing custom residential with a flair for rustic elegance, then broadened his skills to include resort, ranch planning, commercial and public work, in particular university, cultural and educational buildings. Keith founded KA Architecture, Inc. in 2011 in Bozeman, Montana. As design architects, we at KA Architecture are responsible for master planning, developing concepts, executing programs and overseeing construction documents; and ultimately the construction and completion of your desires. Each design challenge represents a collaboration of skills that could be likened to a symphony, an orchestration of tradesman, consultants, engineers and interior designers. Though the challenges become greater as the projects get larger, the composition of the team and communication are critical components in every project. Our Mountain Contemporary, Rustic Alpine and Elegant Craftsman style homes are located in many notable Rocky Mountain Resort locations such as Jackson Wyoming, Big Sky Montana (Yellowstone Club) and Bozeman Montana. Over the last decade, Keith’s design focus has returned to the craft of custom, legacy residential architecture. When an architect is hired to create a home, he/she is invited into the setting of the family: its relationships, its pursuits and its beliefs. For us this is an opportunity to participate in a timeless and ancient craft: the creation of shelter and the warmth of the hearth. Our love of the natural elements, expressed abundantly in our plans, inspires us to design environmentally sensitive, refined and rustic homes that will remain integrated into the natural landscape for many generations. "My wife, Becky and I had for over 25 years, planned on building an alpine compound, in an attempt to spend our “quieter years” in comfort and still attract our mobile children to spend time with us, and with their children. As a C Level Exec in the mass merchant / building materials business, I have traveled the globe and found exciting products, which we felt could someday be brought together in a unique, quality end product. But how to choose a style… and incorporate stone, repurposed wood, reclaimed beams, ethnic painting, wrought iron, and carving capabilities? Once we found property in the high Sierras north of Tahoe, we took a full five years interviewing architects, designers, builders, and engineers, that we felt could combine all of our wishes and dreams. A principal member of one of Bozeman’s premier design groups impressed us immeasurably. Keith Anderson, within minutes of starting our initial interview, impressed us with a style and a grasp for exactly what direction we wished to embark upon. Historically motivated, in order to bring not only products to the table, we wanted a representation of our Family heritage. And right away…. Keith just “got it”. He understood our desire to build a dwelling that would stand for 300 years, one that would accommodate large and diverse “visiting parties”, and how to bring together a multitude of very special materials and off shore labor capabilities in a format that would honor codes and design specifications pertinent to our personal situation. And we wanted it to look like it belonged to our family, perhaps in the Old Country, for hundreds of years. Keith incorporated a cornucopia of styles, details, and images from what we refer to as “The Land of the Blue Eyes”, with roof lines from the Carpathians, gable details from Novgorod, shutters and pediments from Telemark, vertical accoutrements from Roros, and interior carvings and rosemal’ing from Norway and Mecklanburg. And it all just fits…. structurally and esthetically. We are approximately one third of the way through our finished project, and cannot wait to continue seeing what Keith Anderson has in-store for our dreams….."
"Keith is a talented artist and architect. He has designed a beautiful western home for our family. I 100% recommend him for your project." "We interviewed several firms before hiring Keith Anderson and KA Architecture to design our home at the Yellowstone Club in Montana. Keith brought added levels of creativity to the initial design process which others didn't. He is as much an artist as an architect, creating interiors and exteriors for our rustic mountain home (in round logs, reclaimed hewn, and stone) which were both functional and visually striking. His experience as an architect is wide ranging and he is well versed in historical references supporting his ideas. We'd also rate Keith and his firm highly on accessibility and being attentive to client needs/objectives......including the budget. " "This past summer, our family decided to build a new Montana home on a larger scale and hired KA again based upon our prior experience. Look forward to breaking ground May '17." "I would enthusiastically recommend Keith Anderson for any and all architectural needs in exclusive home design. I have known Keith for many years, have viewed multiple projects that he had guided and directed and have continually been impressed as to how his hands on creative, yet practical, skill sets carry the day. Keith takes ownership of every aspect, presents options, details the effects, then proceeds as if the answer was an obvious given. Sophisticated results in architecture occur as a result of experience, bold suggestion and personal commitment to the completed result. In Keith Anderson you can be assured of all the components necessary to produce a finished product to be proud of upon completion and for decades to come. We are fortunate to have some of the most accomplished architectural talents in the country here in our Rocky Mountain back yard. Keith, uniquely, cuts through the hype and falls in love with the task. I couldn't recommend him any more enthusiastically." "It is with pleasure that I write this reference for Keith Anderson. Our family has been working with Keith for a year and are now deep in the build out of our new home." "The building process has been made much easier in that Keith is an architect and also an artist. He has consistently listened to our wishes and had much to add to our ideas. His research is boundless and on target. He and our contractor work well together, kept on budget and have kept our project moving forward in a timely fashion." "My husband and I spent several years developing the concept for our home in Bozeman, Montana before we ever met with an architect. We purchased the land about three years prior to meeting Keith Anderson, who would eventually become our architect. We came to Keith with many very established ideas, plans and hopes for our home. He came to us with the amazing ability to take all of those concepts and form them into our dream, filling in all the structure and detail that is obviously necessary to such a structure. In all honesty, we worried about finding an architect who would be truly open to our ideas...Keith listened! Working with Keith was fun, intriguing and rewarding. After living in our home for just over two years, this dwelling never ceases to amaze us. Keith captured the essence of what we desired in this home, and helped us to make it a true expression of who we are. It is our dream home and we are so incredibly grateful for Keith and his remarkable talent." and created a design where every single room in the house has a spectacular view of the mountains. the one to build it. very excited with the house that is being built. " "I have known Keith Anderson since 2004. As part of Larry Pearson Design based in Bozeman, Keith took our project from concept to master plan and through the first development phase. Keith is distinguished from other talented architects in my opninion by 1) his exceptional ability to listen to and appreciate a client's vision, 2) the way he brings his artist's eye to the design and 3) his significant experience in commercial projects that informs him about both scale and materials in residential work, and 4) his scholorly knowledge of architecture. He is also a pleasure to work with. I have rehired him, KA Architects, to complete our master plan in Bozeman." Over a 25 year period Keith has provided design concepts, architectural design packages and program driven planning concepts over a wide variety of building types, including commercial, mixed use, university, preforming arts and judicial architecture. The firms Keith has done executive consulting for are Gensler, Leonard Parker Associates, Cunningham Group, KKE Architects, JLF Architects, Harriman Associates, Black River Design and Pearson Design Group. His design concepts are hand drawn and then imported into a variety of programs to add lighting, contrast, shadow, text, and logos. The concepts are created on mylar sheets of varying sizes and then stitched together as the size of the format and preferred presentation require. The drawings are built concisely on developed programs and/or client input and are constructed as viable architectural solutions, unlike a rendering which represents a final product and not a work in progress. KA Architecture looks forward to sharing ides that offer value to your client and your company. The Reluctant Architect, An Interview with Keith Anderson. Distinctly Montana 2012. Artist Studio: Artist/architect Keith Anderson Creates Depth In Egg Tempera. Bozeman Daily Chronicle 2012. Life in Abstract: The Art of Keith Anderson. Montana Living 2009. 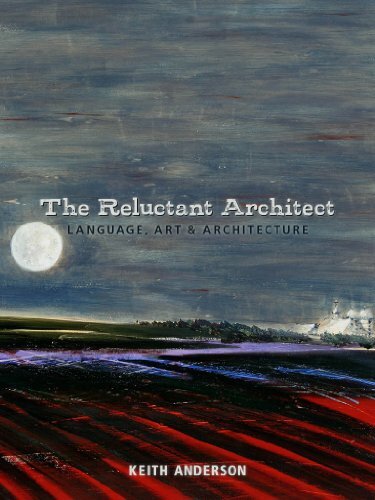 “The Reluctant Architect” is a series of vignettes regarding the nature of language, art and architecture. This journal asks the reader to examine and reexamine the nature of our world and mankind’s contribution to the aesthetic landscape we have created and continue to create. It is no longer enough to merely solve problems; rather we are compelled to advance the most elegant solutions on the nature of how we live. The time has never been better as our native landscape has become littered with the product of a market driven architecture with little or no regard for the fragile nature of the earth and its dwindling resources. In addition, architects have all but forgotten the simple lessons of utility, beauty, proportion and the poetics of architecture. build and the natural world. Egg tempera painting, the mixing of raw pigment with egg yolk, imparts a certain transparency and richness of color that allows a nuance and range not often seen in oil or watercolor. I have been working in egg tempera for 20 years and continue to focus on its unique characteristics. My experience as an architect provides experience and expertise in the architectural design process, the inclusive collaboration involving the environment, client, consultants, and the community of users with an interface of visualization techniques using digital, drawing & modeling means. This process along with the subtler idioms of material and convention, form a more locally based design which thus becomes part of the textural community of space & time. Architecture does not stand alone. It is a public symbol of ancient traditions and modern forms that celebrate the gathering of humanity. KA Architecture, May 2010-Present; Designed and completed 5 custom residences and one commercial remodel as well as begun master planning on a ranch that is being converted into a non-profit to discuss global environmental and socio-political issues. JLF Architects, Bozeman, MT; Senior Design Architect, April 2010- January 2011. Hired to diversify JLFA’s market and bring fresh design ideas to the firm. Brought in two significant design contracts during my tenure. Pearson Design Group, Bozeman, MT; Senior Design Architect, Shareholder, 2003-2010. Multiple published residences in the Yellowstone Club, Big Sky, Minnesota, Colorado & Vermont. Leonard Parker Associates, Minneapolis, MN; Senior Associate, June 2002-December 2003; Dalian, China, 4-million square feet of mixed use, Gwang Gu Convention Center, Gwang Gu, Korea. Gensler Associates, Houston, TX; Senior Designer, July 2001-June 2003; Laredo Community College 235,000 square feet; Cy-Fair College, College Station, Tx, 350,000 square feet; African American Museum, Houston, Tx; 80,000 square feet; Schlumberger Research Facility, Sugarland, Tx; 140,000 square feet; University of Houston Academic & Science Center, 60,000 square feet. KKE Architects, Minneapolis, MN, Senior Design Architect, Shareholder, 1996-2001. Founded Studio Next as an interactive group focused on the changing healthcare market, with projects in Hawaii and California; Lead Designer for a series of university and educational projects, including the Gateway Alumni Center (in collaboration with Antoine Predock), at the University of Minnesota Student Union redesign and rehab; as well as multiple secondary and charter school projects. University of Minnesota, Adjunct Professor, 2002, Drawing & Graphics. Norwich University, Visiting Professor, 1995, Multiple design studies. Vermont Technical College, Adjunct Professor, 1994, Design & Visualization in Architecture.